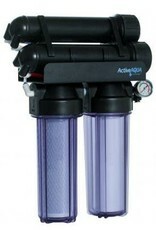 Comes with 1-micron sediment filtration, a carbon block for VOC reduction and a TFC membrane. Also includes quick connect fittings, a shut-off valve, a filter wrench for easy cartridge replacement, and hose bib feed adaptor. 1-year limited warranty. Made in the USA.